CSense Management Solutions is a leading Training and Consulting Company in India in the fields of Lean, Six Sigma, Kaizen and other Operational Excellence practices. We provide certification training in the above domain to corporates and individuals. CSense believes that every person, process, and business can be improved in the journey from where they are to where they want to be. Our vision is to improve the quality of life of every human by increasing profits to clients’ business and spreading the knowledge to inspire people to believe that Wisdom isn’t alien. Doing – Learn while you do. Hands-on Support in applying the learning with pilot applications. We provide world class training at the same time, we adhere to these stringent requirements every time. Hence, our certification is highly respected and gaining a significant respect in the industry. Our robust training feedback system comprises the end of training feedback as well as oral feedback during the sessions. We consider every piece of feedback as vital input towards achieving our vision – Enhancing life of every individual and inspiring them to believe that wisdom isn’t alien. With our structured questionnaire, we evaluate the program with respect to content’s relevance, session organization and faculty’s delivery. Along with these outcomes, we apply statistical analyses to evaluate as well as to present the feedback graphically. We set a target score of 80% at each segment and the detailed feedback scores and graphical summary are shared with our clients. As the next step, we undertake necessary actions taking lessons from the feedback. Even though the training is all about absorption and application to daily life, we support Learning and Development enthusiasts by measuring the change in knowledge (measuring the knowledge transfer), by statistically validating the delta with before and after participant evaluation. We conduct continuous assessments for participants during the training sessions, written or on-line tests after the course. 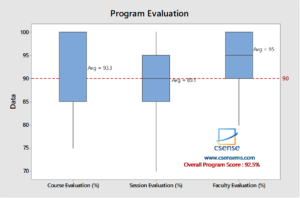 Participants scoring more than 70% score in the exam become eligible for CSense Certification. We certify every participant qualifying the requirements of the course, with unique Certification Identification Number (CIN). In addition to the certification, we also provide a Certification Soft-Badge to qualifying participant with CIN. Hence, with the help of CIN, anyone can trace the participant’s name, certification course details, duration, dates of training undergone, etc.